US Mormon ancestry records pre-date surviving Irish RC parish registers | Where's Merrill? It is strange to consider that the Mormon church, founded in the 1820’s, possesses original ancestry records which pre-date surviving Irish Catholic parish registers and make reference to Irish vital events in the 18th century – before the Mormon church even existed. How can this be? 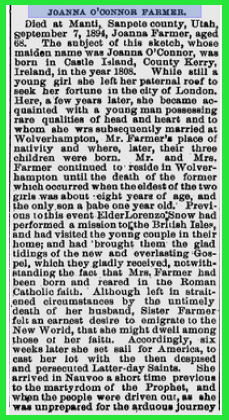 Well … it needs a series of very unusual historical happenings to have taken place in an Irish ancestor’s life, and one such ancestor was Johanna O’Connor born in County Kerry in 1807. Her amazing life story was summarized in a recent post on this blog. Refer to Irish Mormon Pioneer. The key to being able to use exclusive Mormon records to identify ancient Irish family tree members whose names do not appear in preserved Irish church registers is that your research subject must have converted to Mormonism. Conversion from devout Roman Catholicism, as practiced in 19th century Ireland, to the new and very controversial Mormon religion which expanded from American roots to English towns in the 1840’s was literally a major “leap of faith” for any Irish man or woman. Very, very few would fit this ancestral profile. Johanna was not the only Irish person who settled in Utah over 150 years ago, but I have yet to come across another Irish Catholic ancestor who survived the harsh LDS pioneer trail and subsequently filed her mainly 18th century genealogy. Let me know if your own Irish family history contains a similar character. In case you are unaware of Mormon doctrine, a practitioner of this religion is obliged to “baptise” (by proxy) any deceased non-Mormon relative into their Christian church. The deceased ancestor is then believed to have the right to accept or reject the baptism into the Church of the LDS, and Mormon followers consider that acceptance of the LDS faith ensures that the deceased can enter the Kingdom of God [Heaven]. This practice started in 1840, and towards the end of her life, Johanna spent many days during 1889 and 1890 baptizing over 50 members of her extended family. Until recently, we knew where Johanna’s marital in-laws came from (because they feature in corresponding Anglican church registers) but the precise roots of 35 listed Irish relatives could not be established, except that they all came from County Kerry according to Johanna’s LDS Temple notes. It was apparent to every researcher who studied the names that they did not exist in Irish record collections. So where were all these inter-related Irish folk from? The LDS Registrar for Johanna’s baptisms by proxy left one clue by way of some semi-legible scrawl. Alongside the name of Johanna’s father, we could see a town birthplace written as “Bally B- – -“; the last three letters could be interpreted in several ways. The mystery was only solved when genealogists from Price & Associates contributed one extra clue left behind when Johanna passed away in 1894. In most ancestry projects, the goal of the genealogist is to discover the dates of the three normal vital events of their research subject, i.e. birth, marriage and death. The exact places where these events took place is also high on the research agenda. When a researcher is successful enough to track down the date and place of death of the ancestor in question, this information can be used to search for a published funeral notice or obituary … and an obit often opens up links to many “lost” family members who attended the funeral or were given respectful mentions as relatives of the deceased. In Johanna’s case, we thought that the discovery of a four sentence obituary in the Manti Messenger was the sum total of contemporaneous tributes to a remarkable Irish lady. Sadly, the local Manti newspaper article did not reveal anything about Johanna which we didn’t already know, after thorough research. Therefore, it was with great surprise and delight when Diane Rogers from Price & Associates discovered that the Deseret News, the LDS Church’s oldest newspaper in Utah, printed a long tribute celebrating Johanna’s unique life after her demise in 1894. It was a joy to see that the obituary listed obscure facts about Johanna’s life which we had already unearthed from other research sources. Our complicated research processes were fully justified, but it was a bonus to read about other tidbits of Johanna’s life story and her character traits which we had guessed at. Now, we knew for certain that Johanna was the pioneering woman we had envisioned and admired. The Deseret News obit provided one new and crucial O’Connor birthplace clue. As shown below, it states that “Joanna Farmer, was born in Castle Island, County Kerry” [sic]. At last, we had a specific region of County Kerry to investigate. Castleisland is a small town and large civil parish in SW Ireland. Some very intensive studies of the distribution of O’Connor families around Castleisland and the unique geography of the area eventually led me to “Ballybane”, the curious place which widowed Mrs Johanna Farmer referred to as her ancestral homestead in her 1889/90 LDS Temple notes. There is no townland called Ballybane in the civil parish of Castleisland, although namesake places exist in other parts of County Kerry according to the national database of Irish place names. It appears that Johanna referred to her birthplace by its common local name which preceded the formalization of Irish townland designations. In my opinion Johanna was born in Ballybane which forms the southern portion of the townland of Ballyduff, located about 10 miles north of Castleisland town. This region falls within the RC parish of Knocknagoshel, but the local Catholic church registers only survive from December 1866 onwards. So Johanna’s detailed listing of her parents’ generation and her grandparents informs us about a complete Irish family that does not feature in record collections of Irish origin. By accident, Johanna has created a unique Irish Catholic family tree which pre-dates County Kerry parish registers by over 100 years. More recent records indicate that many members of the O’Connor family still reside in and around Ballyduff townland. I would be pleased to converse with anybody who believes that they have connections with the ancient O’Connor and Kirby ancestors listed in Johanna’s Baptism for the Dead. Here’s a recap of the known ancestry of your ancestor Timothy Murphy. Denis Murphy & Margaret Sullivan got married in Rathmore RC parish church in County Kerry on 24th February 1846. Timothy’s death record indicates that he was born in 1846, so presumably he must have been born in Cottage, County Kerry, later in the year after the marriage. The rural townland of Cottage is 2 miles north of the village of Rathmore, and about 12 miles east of the beautiful town of Killarney. Catholic church marriage registers did not record any details about the parents of the bride & groom in this era. The only requirement “in the eyes of God” was that the priest must record the date and his name, alongside that of two witnesses to the ceremony. These witnesses (Daniel and Dermot) were obviously members of the Murphy & Sullivan families, possibly brothers of the bride & groom. The winter of 1846 was the real commencement of the Irish Great Famine. Many families were wiped out through starvation and disease in County Kerry. Many others escaped on coffin ships to the eastern seaboard ports of America. I cannot find an Irish baptism record for Timothy or any other Murphy siblings. This leads me to believe that his parents may have perished in the Famine. Timothy was probably hurriedly adopted as a baby by relatives and whisked off to Boston and relative safety.